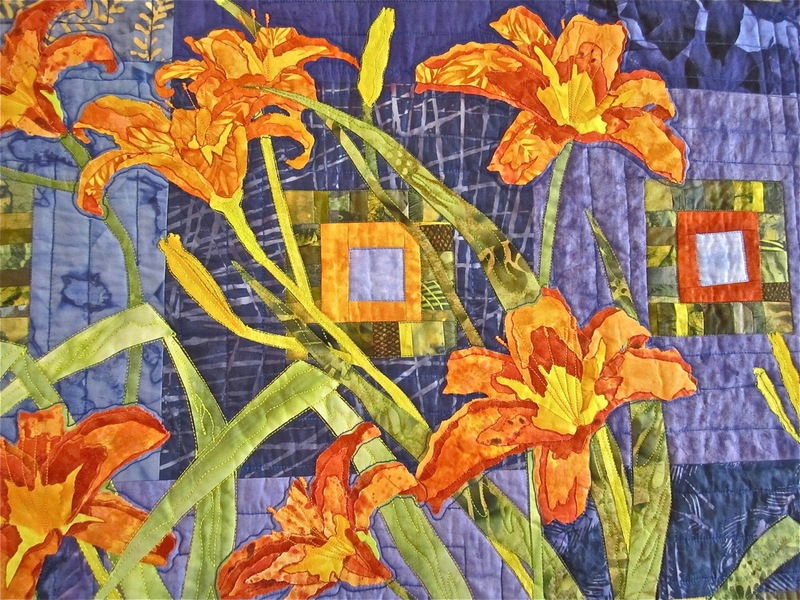 I had the idea that I would feature daylilies for this month’s Garden Bloggers’ Bloom Day when we unpacked the quilt. 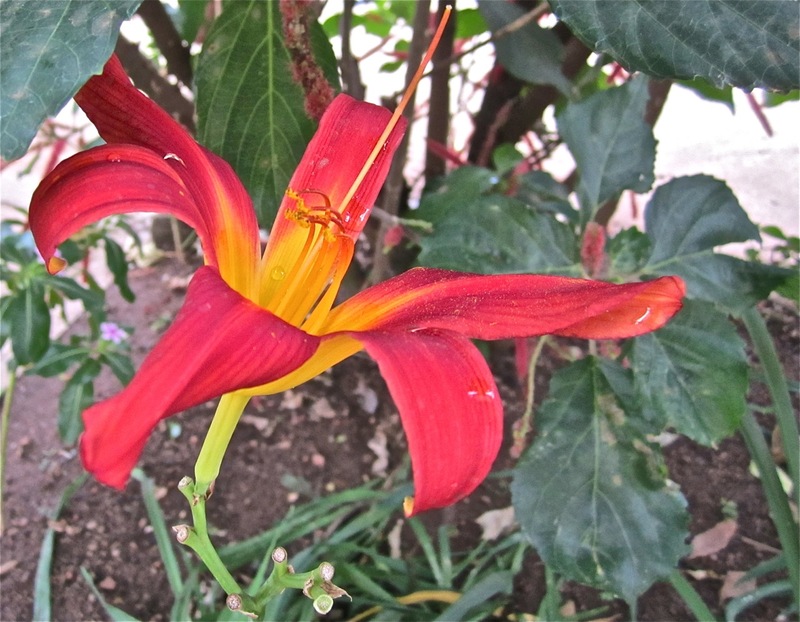 Today, I went out into the garden, which normally has a lot of blooming daylilies around the drive, and found only two. 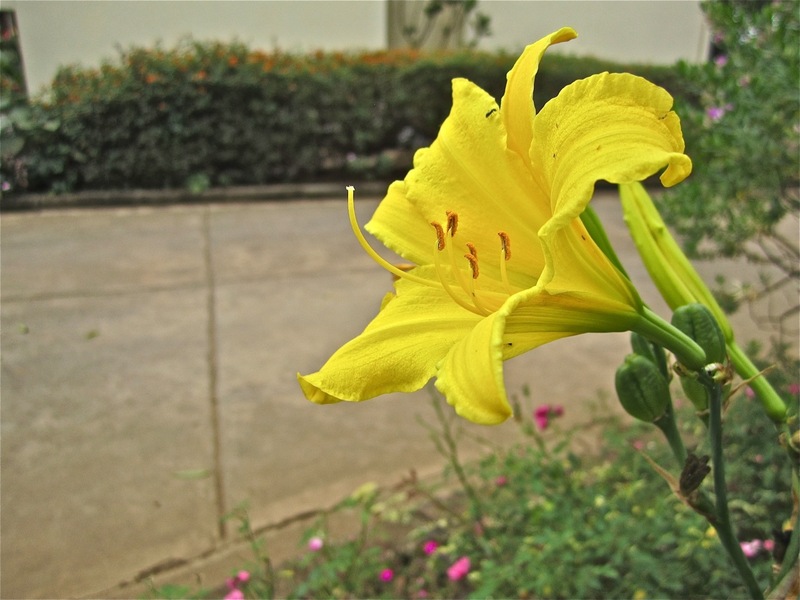 I have no idea which cultivars of Hemerocallis these are. You can see some of the new ones for 2012 at allanbecker.gardenguru. 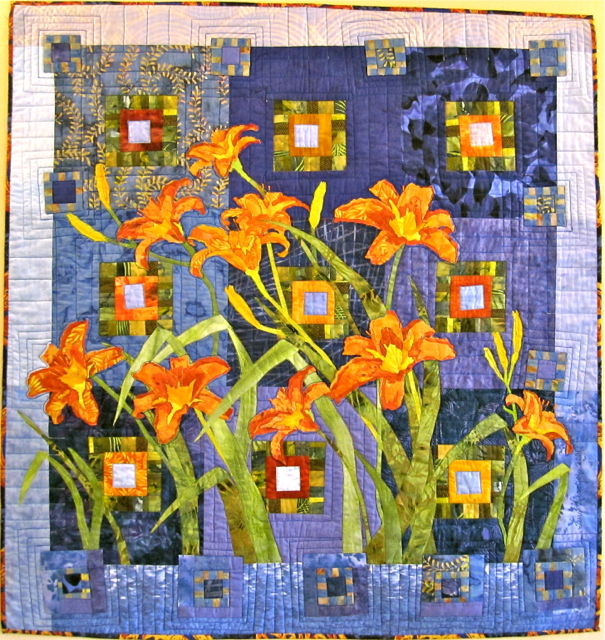 The tiger lilies in the quilt are Hemorocallis fulva. They are native to the Himalayas, China, Japan, Korea, and southeastern Russia and were brought to America from England in the early 17th century. Here’s a little of what else is blooming in the garden today. 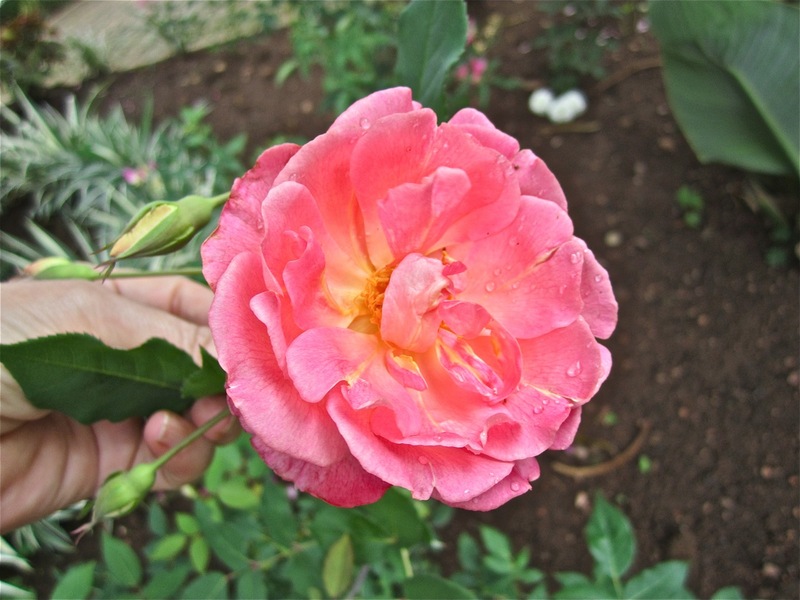 A small pink (a bit coral) shrub rose of unknown variety. This is really nice. We need to try to root some cuttings. 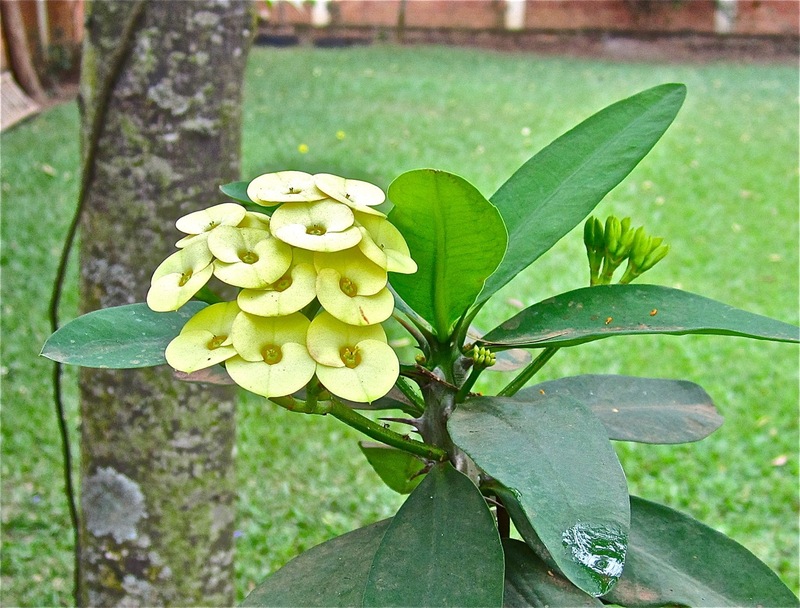 We also have this yellow crown of thorns or Euphorbia Milii, native to Madagascar. I like this plant, and there are two of them in the garden. One, with red blooms, is right next to some steps, and this one is in a rather ugly container next to the parking area. It’s not going to be fun to move them. Our lobster claw or false bird of paradise, Heliconia (I think I have Heliconia rostrata), has put forth a lot of huge blooms, but its foliage is a little tatty. 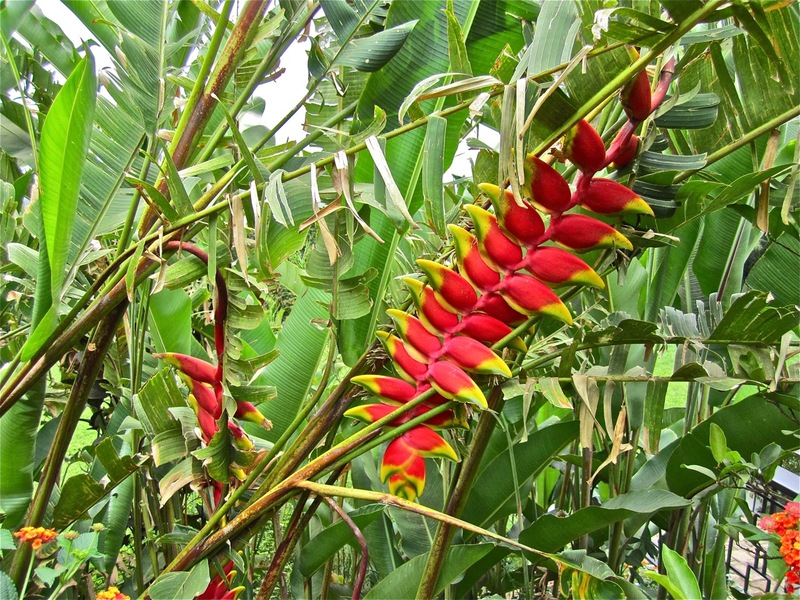 Heliconias are native to the tropical Americas and the Pacific Ocean, west to Indonesia. Thanks to Carol of May Dreams Gardens for hosting Garden Bloggers’ Bloom Day (the 15th day of every month). Some lovely blooms and can’t believe you are looking at Daylilies already. Thanks! I was just looking at yours. I think I have a “Patio Rose” too. How lucky to live in Hawaii! I consult blogs and websites from there often, trying to identify my tropical plants. I’m not sure why it still should, but it continues to amaze me how plants from the far reaches of Asia and the Pacific and Latin America are growing in Rwanda. Wow! Stunning blooms! I love the lobster claw–just gorgeous. 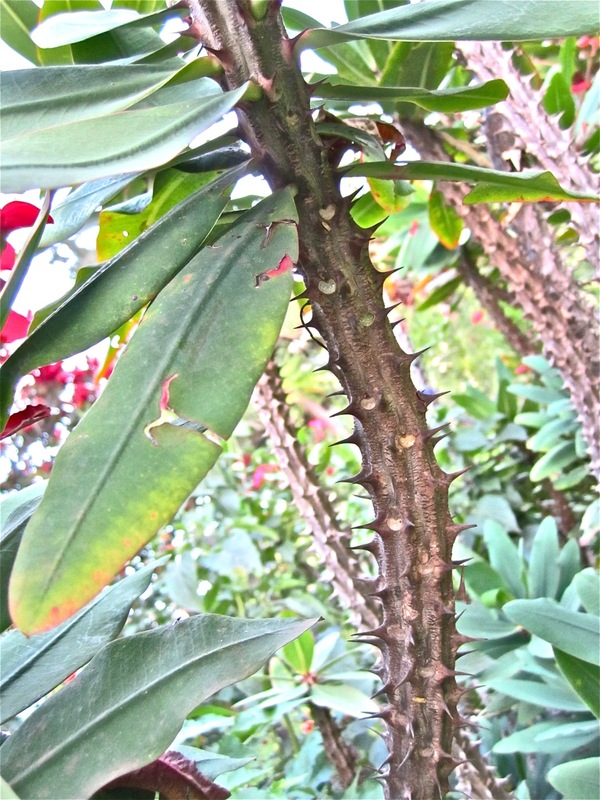 And be careful moving the pot–those are some nasty thorns! Thanks for sharing your lovely blooms. Happy GBBD! Cindy, I am totally smitten with Terry Kramzar’s quilt. Thanks for including the link to her site; I clicked through and saw some beautiful pieces there that I would love to own and could actually afford. We are very lucky to be able to live with her work for the next two and a half years. The quilt over the sideboard is actually making me think I want to move some of our daylilies to in sight of the dining room doors, so I can see the flowers all around. The same room has some a nice reproduction of a Chinese screen with a botanical motif, and it’s nice to see how well the quilt goes with it.